New Trends in Natural Dyes for Textiles addresses 20 natural dyes that are finding innovative uses in industry and academia. 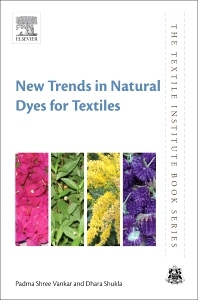 It comprehensively addresses issues relating to natural dyes and dyeing problems, including efficient extraction and standardization of dyes, dyes structure, dyes characterization and identification. Readers working in the dyeing of textiles will learn how to improve practices to minimize environmental pollution, avoid bad dyeing, and select the best mordants to fix colorant compounds. Key benefits of natural dyes over synthetic are examined in detail, providing readers with an understanding of the importance of natural dyes and the proper methods for applying them. Dhara Shukla is a Senior Research Associate at the FEAT Laboratory, IIT Kanpur. Her research is focused on dyeing, with newer Natural dyes, Nanochemistry and its application in textiles and Heavy metal mitigation with fungal and other biotic sources.